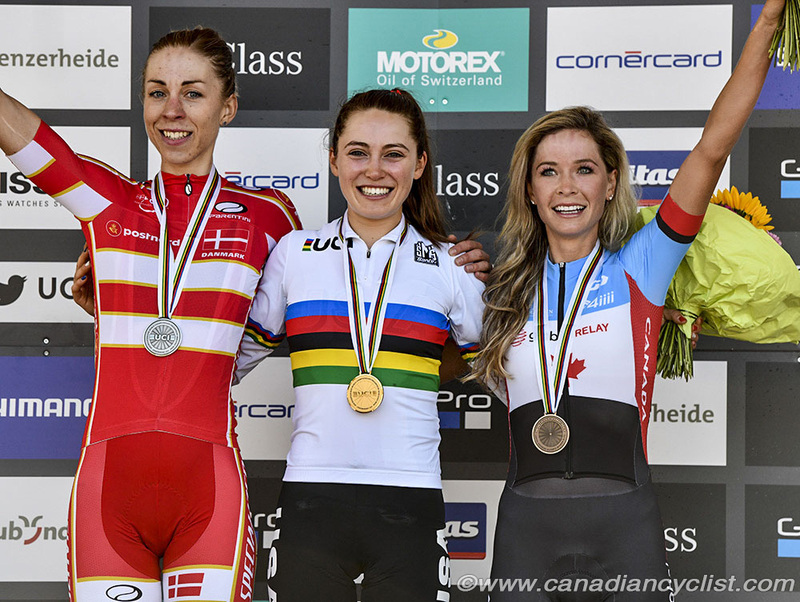 Canada's Emily Batty won the bronze medal in the Elite women's cross-country on Saturday at the Mountain Bike World Championships in Lenzerheide, Switzerland. She was joined in the top ten by Haley Smith in sixth, with Catharine Pendrel finishing 14th after suffering a flat tire while in the top ten. 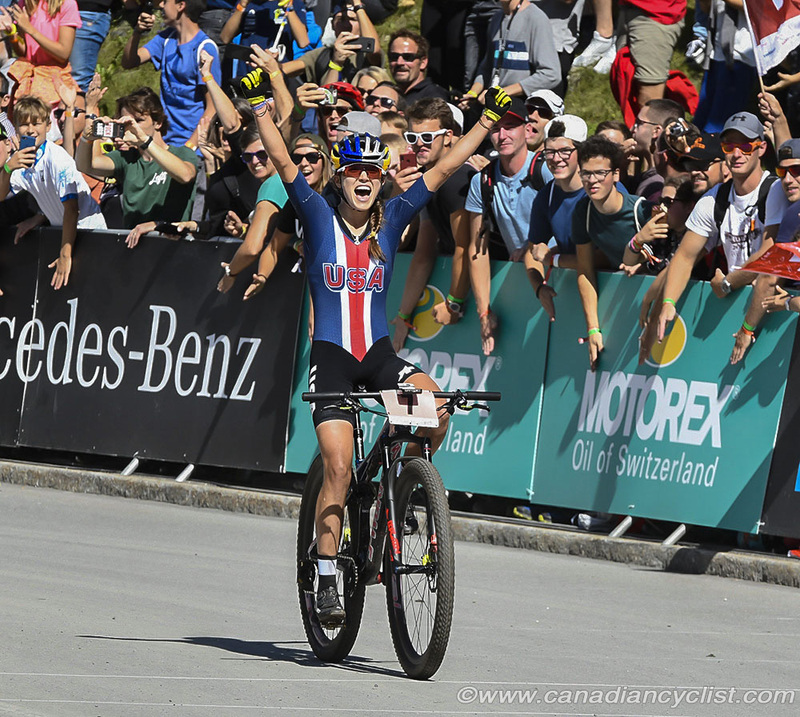 The final day of XCO competition saw a first time Elite world champion in Kate Courtney of the USA for the women's competition, while Swiss hero Nino Schurter did not disappoint the home crowd with a victory in the Elite men. 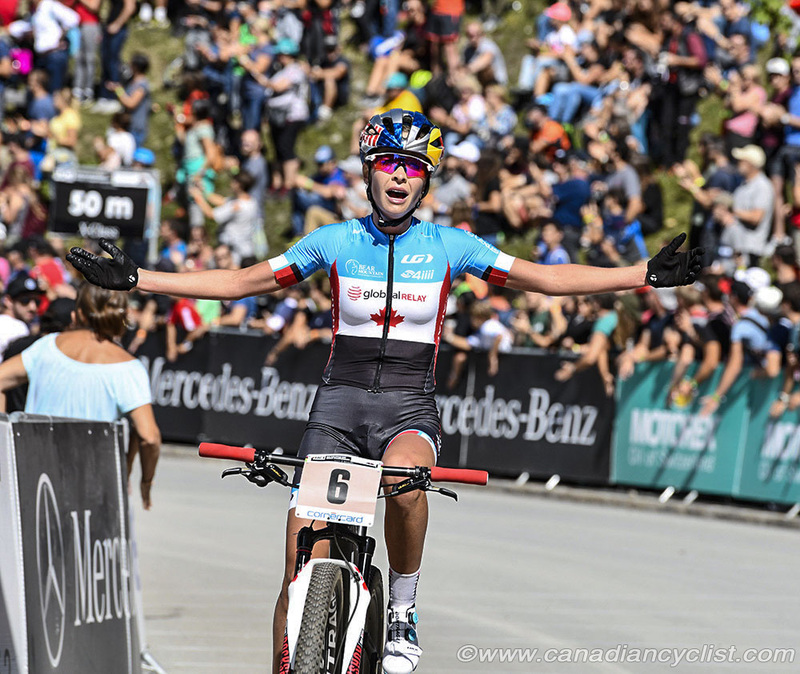 The Swiss finished the XCO portion of the world championships with four wins in seven races. As forecast, the day was blue skies and sun, with a crowd in excess of 20,000 coming out to cheer on the athletes. The women's race began with an attack by 2016 world champion Annika Langvad of Denmark, who opened a gap on Courtney and Batty. Langvad seemed to have the race under her control, with a 35 second gap on the two chasers by the end of the second lap. However, Courtney dropped Batty on the fourth lap and caught Langvad by the end of the lap after Langvad crashed. The Danish rider pulled away slightly on the next lap, but they were back together by the penultimate sixth lap, and Courtney dropped her rival in the technical sections on the final lap to win by 47 seconds. Batty hung on for third behind a fast closing Jolanda Neff of Switzerland. With her win, Courtney becomes the fourth American woman to win the Elite women's title, and the first since Alison Dunlap in 2001. "It's an absolute incredible feeling to win," said Courtney, 'I don't know if it's really sunk in yet. I was so focussed on executing my race plan, and to look up at the finish and realize that I was first was an incredible feeling. I just focussed on riding the cleanest lines I could, and I knew that was my opportunity." Batty clearly went 'all in' on her race, and had to lie down after the finish, then be helped to the podium. "I'm so proud," said Batty. "When I was racing, I knew that there was no way I was going to walk away without a medal. I found my limit; I've never gone as hard as today. that was my goal: to turn myself inside out, and leave it all out there. We [Batty and Courtney] did get a good gap from behind early in the race, and I just tried to hold that. I feel like I'm just starting to grow into my potential." Smith moved up into 12th by the third lap and was tenth a lap later. By Lap 5 she was into sixth, and on the seventh and final lap moved past Maja Wloszczowska of Poland into fifth, before crashing and losing a spot. "I don't really know what to say," admitted Smith. "This kind of thing doesn't feel real until it happens. I'm just really excited and grateful for the whole journey this year, and I'm excited to keep working for more. I got by a few people on the first lap, and then I was just picking them off one at a time. I was climbing well, but riding the roots really well, which is the Victoria [B.C.] training coming out. I got up to fifth with a good gap, and then I tried to rail a section hard and clipped a stake, and crashed. It's my own fault from a silly mistake, but I'm still happy with sixth." Catharine Pendrel, starting back on the fourth row, had a strong start and was in the top ten by the second lap. She was joined by Smith on Lap 4, who passed her, but Pendrel was still in good shape for a top ten until a lap and a half to go, when she suffered a flat tire. Pendrel is still coming back from a mid-season broken arm. 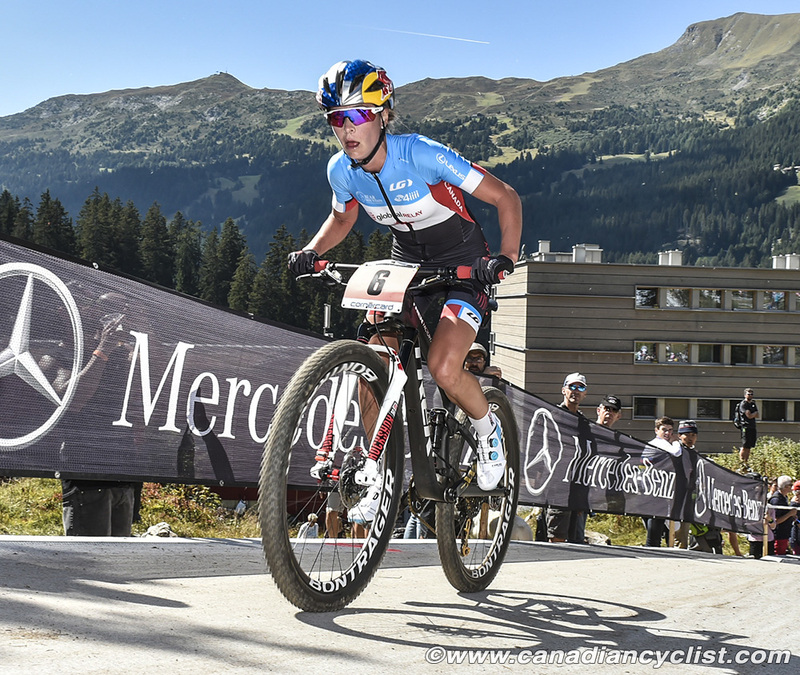 In other Canadian results, Sandra Walter finished 21st, after riding in the top-20 for most of the race, Cindy Montambault was 31st, Elyse Nieuwold was 38th, and Catherine Fleury was 42nd. Dan Proulx, National Mountain Bike Coach, said, "I'm very pleased with the Team's performances this week. Our goal is to create an environment where champions are inevitable and each year we're moving closer to that." "Without a doubt the ride of the week was Emily's Bronze medal. Her ride capped an amazing season - her best so far. I know she'll be hungrier than ever to win this one next year." "Haley Smith deserves a huge congrats on her sixth place ride. Two years ago, her best finish in Elite was 42nd. She's come through the ranks quickly and consistently - starting 2018 with a Bronze at Commonwealth Games. Her work ethic and determination are incredible and I'm confident that this is just a stepping stone to future success." "We had such a good vibe within the team this week. Everyone was relaxed and focused. It's the kind of positive environment that brings out the best in people. Thanks to all the athletes, their coaches and the Cycling Canada support staff for doing a great job!"